The Grand Launch and Red Carpet of Habib Rehman’s song ‘Guzray Pal’. Directed by Film star Noor Bukhari held at Faletti’s Hotel, in the presence of Habib Rehman, Noor Bukhari, Rachel Khan, Aurangzeb Laghari, Rashid Mehmood, Abdullah Muzaffar, Rizwan Anwar and other shinning Stars of the Media Industry. Noor Bukhari and Habib Rehman hit the Music Industry with their project Guzray Pal which features the amazing Rachel Khan. Habib Rehman, who has quite a fan following is a talented and emerging singer. He also owns a production house named HR Production. Noor Bukhari is a versatile and popular actress who owns a great number of hits to her credit. Noor is a topnotch Actress and film star, she has already given Pakistani Media Industry a number of massive hits from the past two decades. She has a remarkable contribution to the media industry, in modeling, acting and now directing. This time she took the DIRECTOR’S seat for Habib Rehman’s song Guzray Pal. 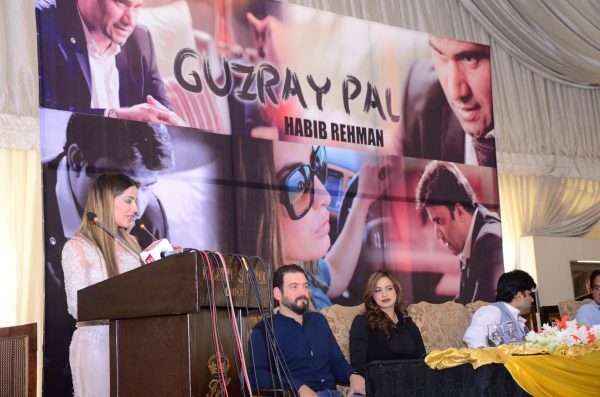 Guzray Pal by Habib Rehman is released under the banner of Beyond Records. 8xm and Jalwa along with bestsongs.pk are exclusive music partners of Guzray Pal.